The Engineering 2014 exam results for admission to various courses have been published at the Office of the Commissioner for Entrance Examinations and on the website. The Engineering Rank List for KEAM 2014 has been declared for those students who have qualified in exam and have submitted their Plus two marks according to the rules set by KEAM Commission. 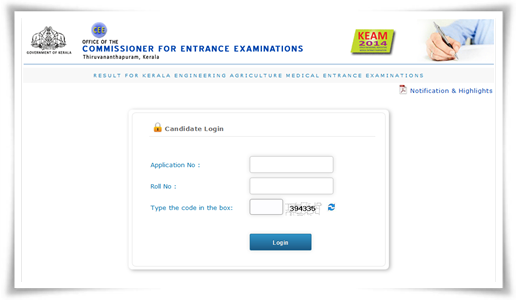 As the admissions to the engineering courses will be based on the KEAM 2014 Rank lists, students who are included in the Kerala Medical (Except MBBS/BDS)/Engineering/Architecture entrance examination rank lists can register their options on the CEE website before the stipulated date. Much prior to the declaration of the rank lists, the office of the Commissioner for Entrance Examinations had published the marks data submitted by the candidates for verification. The marks data submitted as on 09.06.2014 has been used for the preparation of Engineering/Architecture Rank Lists 2014. The Engineering Rank list 2014 has been prepared by giving equal weightage (50:50) to the scores obtained in the Entrance Examination for Engineering (Paper I & Paper II) and the grade/marks obtained for Mathematics, Physics and Chemistry/Computer Science/Biotechnology/Biology put together in the Second year of the qualifying examination (Plus Two or equivalent) after effecting the standardization methodology. The marks of Class XII computed out of a total of 300 marks after standardization plus the KEAM 2014 score (Paper I & Paper II put together) has been computed out of 300 and corrected to four places of decimals. According to the criterion, the KEAM 2014 rank list for Engineering Courses is prepared based on the total marks obtained out of an Index mark of 600. The marks obtained by the candidate in the Engineering Entrance Examination (Paper I & Paper II put together) is computed out of 300 and it is added to the total standardized marks of Mathematics, Physics and Chemistry/Computer Science/ Biotechnology/Biology as the case may be in the qualifying examination figured out of 300 making it a total of 600. Students have to enter their Roll No and Application No to access their KEAM 2014 Engineering Rank. If the marks submitted by the candidate which was used for the preparation of the rank list differ from the actual marks secured by that candidate, he/she will be barred and with liable for penal action in accordance with law. Candidates will be admitted to the courses only after the verification of academic eligibility made by the college authorities.